The machine is composed of feeder, grading wheel, pulverizing blades, gears, pulverizing motor, discharging gate, fans, collection box, dust collection box and etc. Any raw material, being feed into the grind chamber through the upper feeder, is pulverized by high-speed running blades. The fineness of the finished products is regulated via the distance adjustment of grading wheel and grading plate. The high-speed running fans will lead those pulverized material from grinding chamber to discharge gate via negative pressure while whose unpulverized remained in the chamber. The dust from grinding is filtered and recycled via the cloth bag or filter of the dust absorption box. 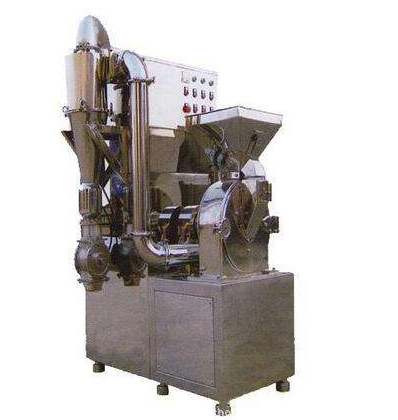 The whole machine, designed according to GMP standard, is made of stainless steel, with the features of easy structure, convenient operation and cleaning, low noise and high capacity, avoiding dust flying in production.